The Seed Cylinder feeders are popular with people who have been bird feeding a long time and for beginners. 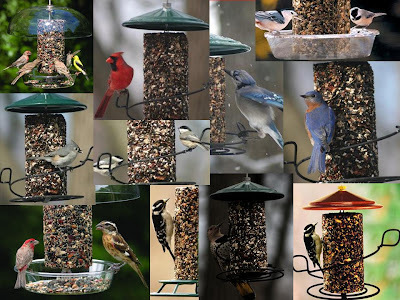 It is one of the easiest feeders to maintain and attracts a wide variety of birds. For people that aren't able to get out to fill feeders often during our harsh Michigan winters this feeder is ideal. Depending on bird activity in your yard, a 2lb cylinder can last up to a month and a 4.5lb cylinder can last a couple months. 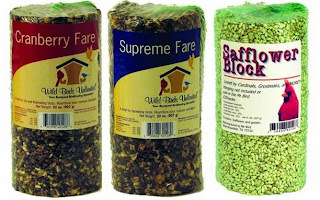 Our popular Supreme Fare Solid Seed Cylinders are packed pecans, sunflower chips, peanuts, safflower, black oil sunflower and the Cranberry Fare also has cranberries - everything you need to get lots of birds to visit your backyard with very little mess. And it's convenient, too. We have several feeders that hold the cylinders, and create perching areas for birds like the Northern Cardinal. If you don't have a baffled Wild Birds Unlimited Advanced Pole System and worry about the squirrels, the Safflower cylinder will keep most squirrels and blackbirds away. Seed cylinders are a fun new way to feed the birds that is both easy and affordable.